Or just over 22 hours to be precise. 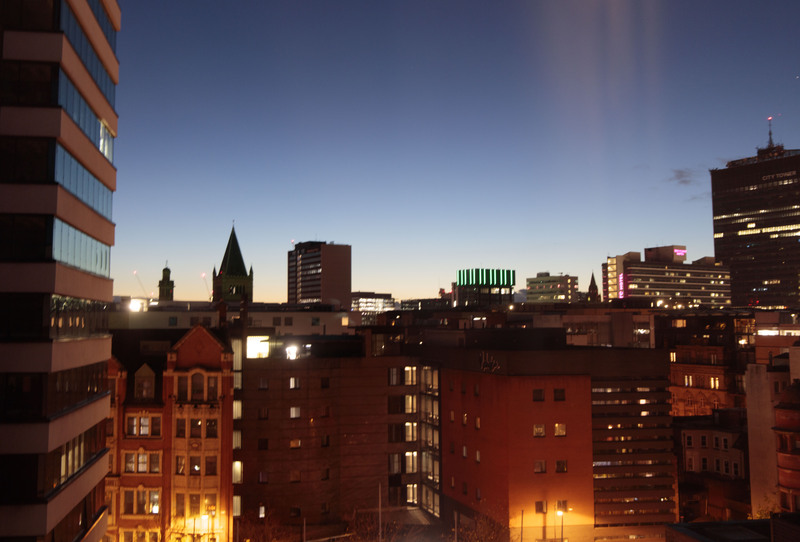 Our train pulled into Piccadilly Station with enough time to settle into our hotel in Dale Street before sunset. The sun disappeared quickly behind the buildings and lights came on accompanied by the sound of distant fireworks. This part of the city reminds me a little of the garment district in midtown Manhattan which we visited last year. There are even a couple of wholesale fashion houses in some of the side streets. 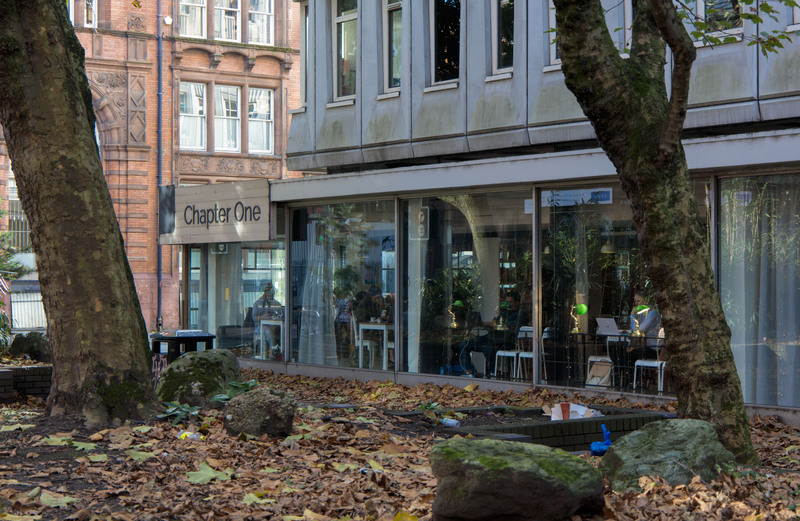 One more recent addition is Chapter One at 19 Lever Street; an independent bookshop which opened in 2016. Their website notes that in 2013, over 1,000 bookshops in the UK closed down and from 2013 to 2015 not a single new UK bookshop opened. It is also a cafe, welcomes people who want to sit and work and has interesting decor. There are not a lot of books on display but they also sell online and host a weekly creative writing group. The main reason for visiting Manchester was to see some live music recommended by friends we had made at Cornbury Festival in the summer. Rusty Shackle are a Welsh indie rock group who were performing at Gulliver’s pub on Oldham Street which regularly hosts live music. 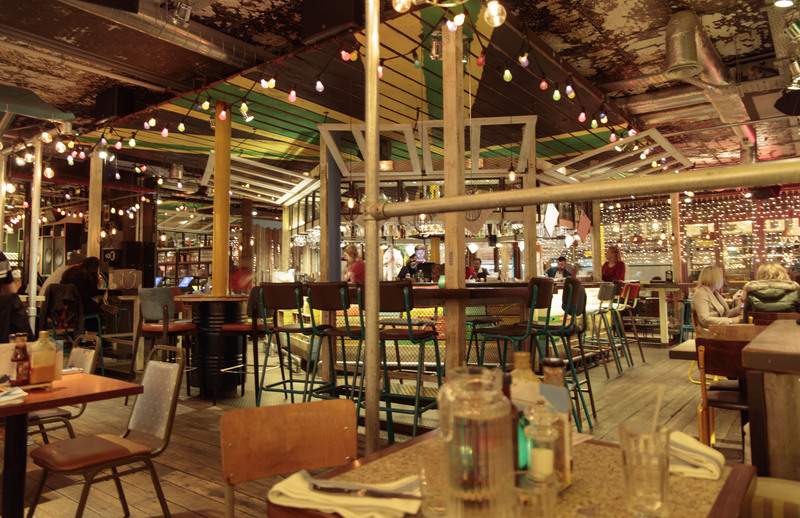 En route we had an early evening meal at Turtle Bay, a Caribbean restaurant near the venue. We arrived at the pub before the venue door opened so had a beer downstairs in the bar. It had some interesting light fittings. The venue upstairs appeared to have been made by combining three rooms with ceiling roses, chandeliers and painted a deep red colour. It chimed with Rusty Shackle who have standard lamps on stage and one by the mixing deck. 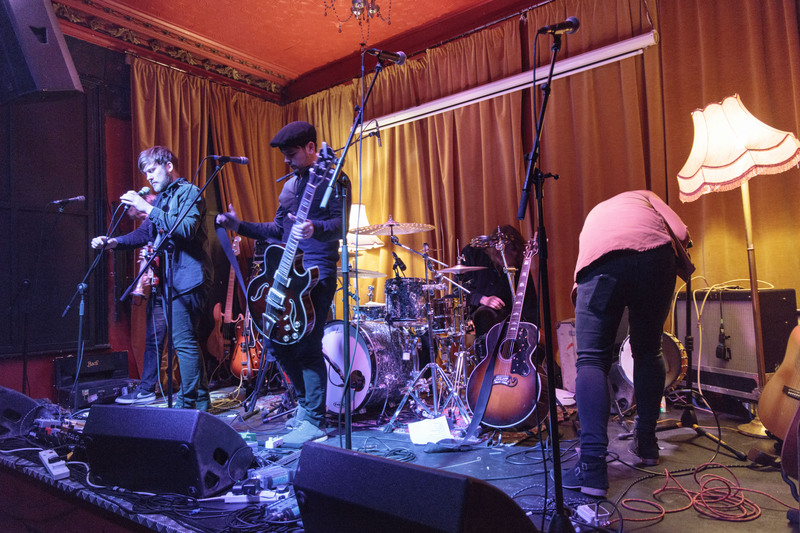 The support act was a group from Colne called Folkestra who describe themselves as ‘a punk-driven rock-fuelled folk machine’. My musical preference was for Rusty Shackle who came on at 9.30pm. In addition to the usual guitars and drums, the bass guitarist also played a trumpet and one of the other guitarists did some percussion as well. Here they are setting up. The next morning we headed wandered around the city centre doing a little Christmas shopping. The Christmas market stalls were under construction but it is likely to be after Christmas before we have another day in the city. Avonlea said yet again she wants to be you—she cannot wait to travel. 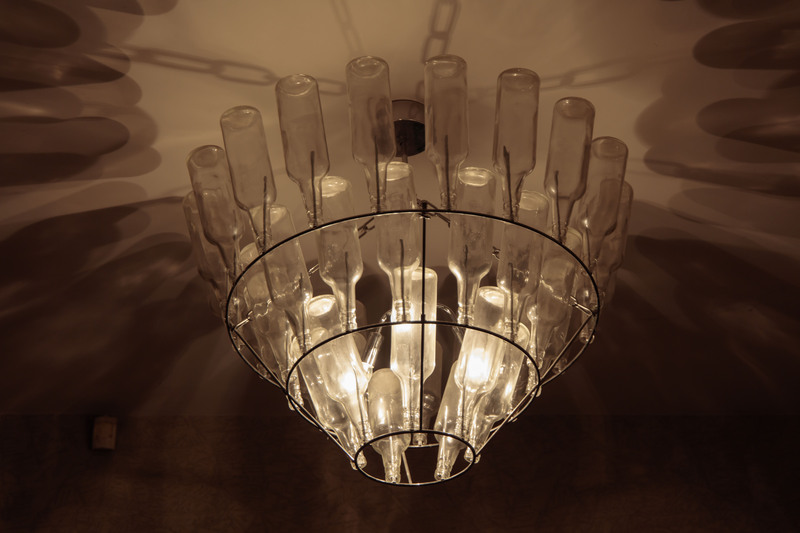 I’ve never seen a light fixture made out of bottles like the one in that photo. Rusty Shackle’s music sounds intriguing, so I’ll see if their performances are on YouTube or perhaps they have a website. “Chapter One” is a great name for an indie bookstore. And how disheartening that “in 2013, over 1,000 bookshops in the UK closed down and from 2013 to 2015 not a single new UK bookshop opened.” Our local used bookstore Logos recently closed after something like a 20 or 30 year-run; very sad.